When you think of scooters, which brand pops into your head? The A model Micro scooter by Razor was the original handlebar equipped kick to ride scooter mass produced and sold in the United States. Over 5 million were sold in the year 2000. Since then, the company has grown and expanded into the world of electric motorized scooters. 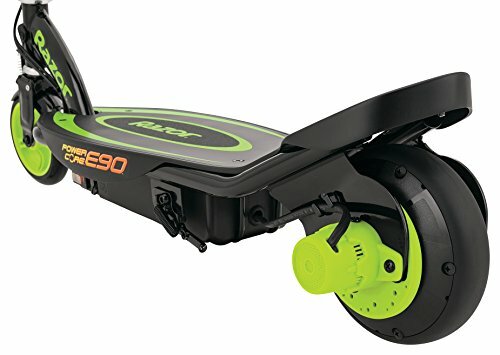 Their Razor E-90 is a small kick to electric transitional scooter, perfect for kids. 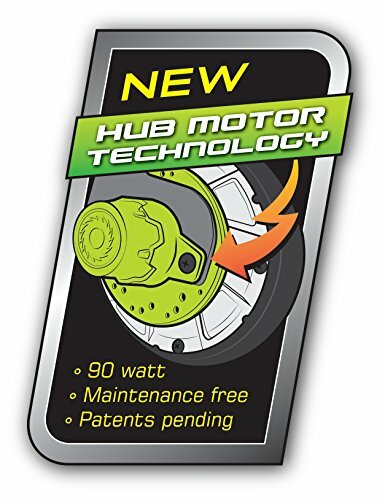 It travels at safe speeds, is easy to operate, and offers Razor’s great quality at an affordable price. The Razor brand has been around since the late 1990’s and gained popularity in 2000 when their folding Razor micro scooter was mass produced and sold all over the world. Since that time, the Razor company has grown and expanded to provide a wider variety of products to a wider consumer group. One factor in Razor’s popularity is the relatively low cost of their products while maintaining a high standard or quality and durable materials. 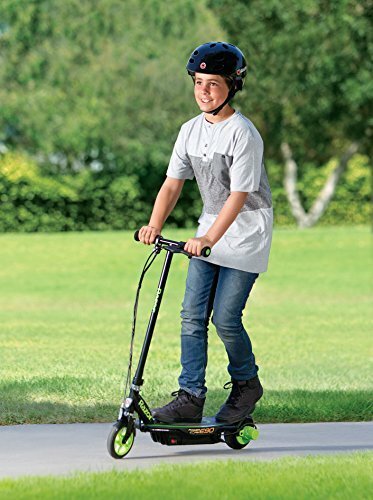 Originally marketed as toys, Razors scooters now come in stand up and sit down models with and without electric motors. Increasing numbers of adults are purchasing Razor scooters for personal use. 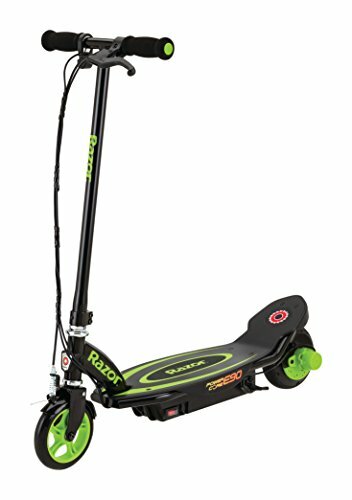 The Razor E-90 retains the classic style of the original kick ride scooter but brings it into the 21st century with the addition of a high torque chain driven motor. 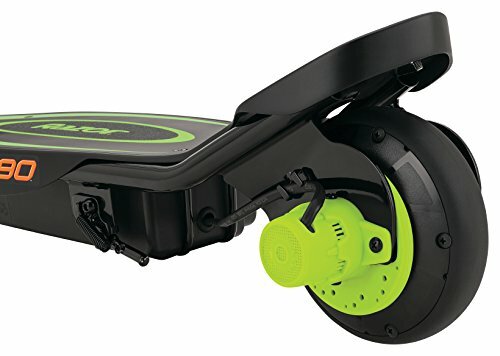 This allows the rider to choose between kick push riding or zooming along under electric power. The Razor E-90 will travel for about 40 minutes, on a single charge of the 12 V sealed, lead and acid battery, depending on rider weight and terrain. 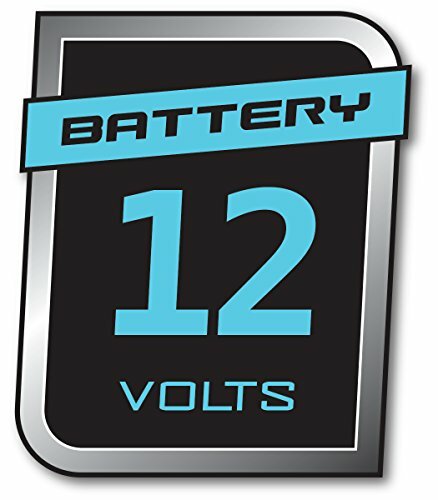 Battery recharging takes a minimum of 12 hours using a standard household outlet and the included recharging cable. The E-90 will carry travel at up to 9 mph, depending on rider weight and terrain. This scooter is best suited for travel on smooth, level terrain. The push button throttle control is easy to operate and is mounted on the right hand comfort grip. Riders can easily transition from electric power to kick style riding. A pressure sensitive foot operated rear wheel brake provides gradual slowing for safety, but it is necessary to release the throttle and begin naturally slowing before applying the brake. The front and rear tires are made of durable urethane and provide a quiet ride both indoors and outdoors. 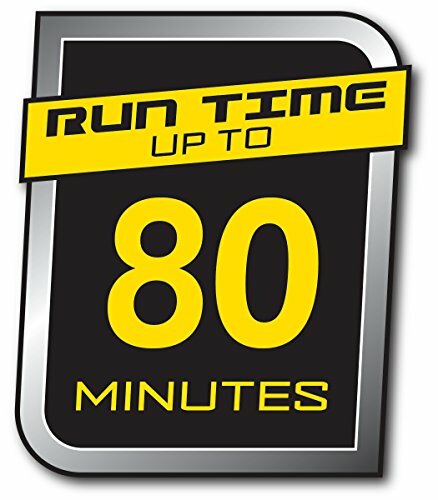 The Razor E-90 is made to travel over smooth surfaces, such as concrete or smooth asphalt. 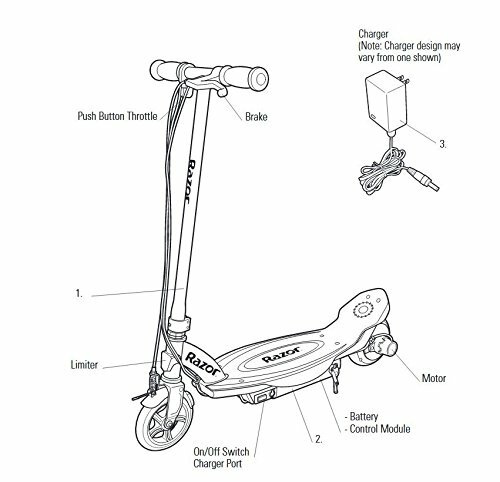 The scooter is recommended for riders up to 120 pounds, and is best meant to be used by children or teens. The Razor E-90 is a high quality scooter made of strong, durable materials. It offers a 12V rechargeable lead filled battery. The push button throttle and pressure sensitive foot brake make it easy to learn to ride, even for children. The Razor E-90 is a small, lightweight scooter, best suited for children. It only travels up to 9 mph and the fully charged battery only lasts for about 40 minutes. Recharging takes a minimum of 12 hours, but the manufacturer recommends longer charging. The scooter comes unassembled in a flat box. Assembly is not hard, but it is inconvenient. 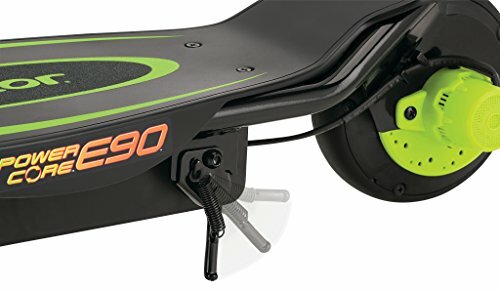 The urethane wheels limit the surfaces the scooter can travel on, and rubber wheels would be better. 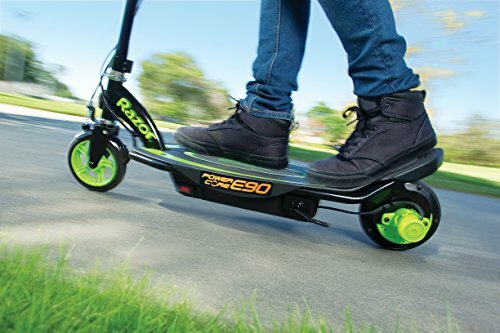 The Razor E-90 is a compact, lightweight stand up scooter for teenagers or very small adults. It will allow about 40 minutes of ride time on a single charge of the included 12V sealed lead battery. Recharging time takes at least 12 hours and uses standard household current. Safety features of this scooter include a push button throttle, foot operated rear brake, and chain guard. 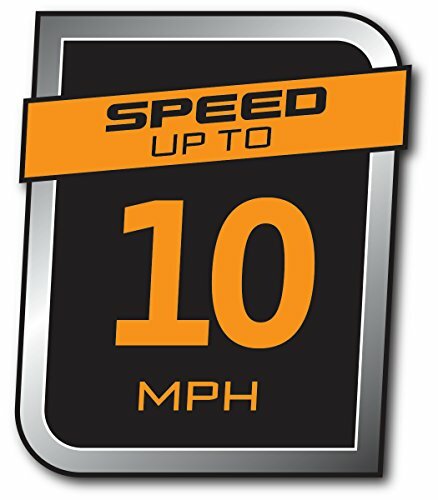 The scooter is recommended for riders over 10 years of age weighing less than 120 pounds. As with any motorized vehicle, a safety helmet is recommended.